What Do We Know About Long and Variable Lags? Purveyors of standard monetary policy lore argue that the effects of monetary policy are subject to "long and variable" lags. The idea appears to originate with Milton Friedman. Quoting from "A Program for Monetary Stability:"
There is much evidence that monetary changes have their effect only after a considerable lag and over a long period and that the lag is rather variable. In the National Bureau study on which I have been collaborating with Mrs. Schwartz, we have found that, on the average of 18 cycles, peaks in the rate of change in the stock of money tend to precede peaks in general business by about 16 months and troughs in the rate of change in the stock of money to precede troughs in general business by about 12 months ... . For individual cycles, the recorded lead has varied between 6 and 29 months at peaks and between 4 and 22 months at troughs. The "National Bureau study" he mentions, which was not yet published when he wrote "A Program for Monetary Stability," is Friedman and Schwartz's "A Monetary History of the United States, 1867-1960." The Monetary History is the key empirical work backing up Friedman's monetarist ideas. Roughly, this empirical work consisted of a compilation (and construction where necessary) of monetary measurements for the United States over a long period of time, followed by the use of relatively crude statistical methods (crude in the sense that Chris Sims wouldn't get excited by the methods) to uncover regularities in the relationship between money and real economic activity. As you can see from the quote, turning points in time series were important for Friedman. In part, he wanted to infer causality from the time series - if turning points in the money supply tended to precede turning points in aggregate economic activity, then he thought this permitted him to argue that fluctuations in money were causing fluctuations in output. But, Friedman could not find any regularity in the timing of the effects of money on output, other than that these effects took a long time to manifest themselves. Thus, the notion that monetary policy lags were long and variable. The Monetary History formed a foundation for Friedman's monetary policy prescriptions. According to Friedman, central banks had two choices. They could either take the car and drive by looking in the rear-view mirror, or take the train. That is, the central bank could exercise discretion, put itself at the mercy of long and variable lags, and perhaps make the economy less stable in the process, or it could simply adhere to a fixed policy rule. From Friedman's point of view, the best policy rule was one which caused some monetary aggregate to grow at a fixed rate forever. If the primary source of instability in real GDP is instability in the money supply, then surely removing that instability would be beneficial, according to Friedman. The modern version of the Monetary History approach is VAR (vector autoregression) analysis. This preliminary version of Valerie Ramey's chapter for the second Handbook of Monetary Economics is a nice survey of how VAR practitioners do their work. The VAR approach has been used for a long time to study the role of monetary factors in economic activity. If we take the VAR people at their word, the approach can be used to identify a monetary policy shock and trace its dynamic effects on macroeconomic variables - letting the data speak for itself, as it were. Ramey's paper describes a range of results, but the gist of it is that the full effects of a monetary policy shock are not manifested until about 16 to 24 months have passed. This is certainly in the ballpark of Friedman's estimates, though the typical lag (depending on the VAR) is somewhat longer than what Friedman thought. Thus, modern time series analysis does not appear to be out of line with the work of Friedman and Schartz from more than half a century ago. But, should we buy it? First, there are plenty of things to make us feel uncomfortable about VAR results with regard to monetary policy shocks. As is clear from Ramey's paper, and to anyone who has read the VAR literature closely, results (both qualitative and quantitative) are sensitive to what variables we include in the VAR, and to various other aspects of the setup. Basically, it's not clear we can believe the identifying assumptions. Second, even if take VAR results at face value, the results will only capture the effect of an innovation in monetary policy. But, modern macroeconomics teaches us that this is not what we should actually be interested in. Instead, we should care about the operating characteristics of the economy under alternative well-specified policy rules. These are rules specifying the actions the central bank takes under all possible circumstances. For the Fed, actions would involve setting administered interest rates - principally the interest rate on reserves and the discount rate - and purchasing assets of particular types and maturities. Once we think generally in terms of policy rules, the notion of long and variable lags goes out the window. In principle, the current state of the economy determines the likelihood of all potential future states of the economy. Then, if we know the central bank's policy rule, we know the the likelihood of all future policy actions. But some of those future economic states of the world may not arise for many years, if ever. For example, if the policy rule is well-specified, it tells us what the central bank will do in the event of another financial crisis. Under what circumstances will the Fed lend to large and troubled financial institutions? How bad does it have to get before the central bank pushes overnight nominal interest rates to zero or lower? To what extent should the central bank engage in quantitative easing? And so on. This is basically what "forward guidance" is about. In a world with forward looking people, promises about future actions matter for economic activity today - monetary policy actions need not precede effects. All of this raises doubts about what we can learn about monetary policy effects from a purely statistical analysis. Unfortunately the data is not very good at speaking for itself. But, we have models. In those models, we can think about any policy experiments we want (within the bounds of what the model can handle of course), and we can rig those experiments in ways that allow us to think about long and variable lags in a coherent fashion. Basic frictionless models commonly used in macro have essentially no internal propagation. For example, the standard representative agent neoclassical growth model with technology shocks (i.e. RBC) exhibits some propagation through the capital stock - a positive technology shock implies higher investment today, higher capital stock tomorrow, and higher output tomorrow. But that effect is very small, and the basic RBC model fits the persistence in output by applying persistence in the technology shock. Indeed, in that model the properties of the time series of aggregate output are determined primarily by the time series properties of the exogenous technology shock, so that's not much of a theory of propagation. Add monetary elements to basic RBC without other frictions and not much is going to happen. For example, in Cooley and Hansen's cash-in-advance model, monetary impulses don't matter much, and certainly don't produce Friedman's long and variable lags. Of course, we have frictions. Sticky prices will certainly act to produce nonneutralities of money that will persist. But it's well-known that the quantitative effects are highly sensitive to assumptions about pricing. With Calvo pricing, monetary shocks are a big deal, but with state-dependent pricing, the effects are small. Other work by Francesco Lippi and Fernando Alvarez shows that small changes in the pricing protocol - for example setting two prices (a sale price and a regular price) from which to choose - can dramatically reduce the effect of a money shock. 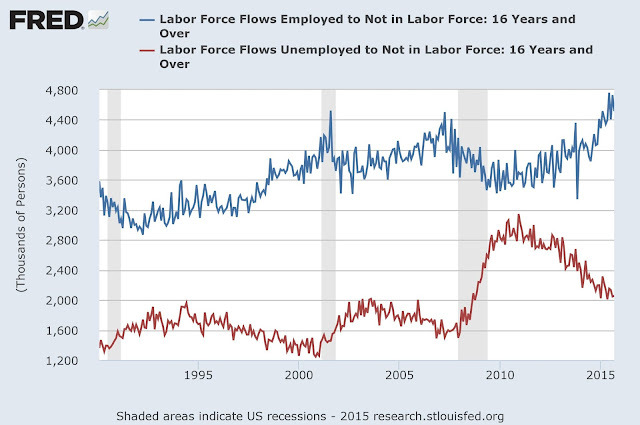 Another propagation mechanism with some claim to support from serious theory is labor search. The fact that successful matches in the labor market take time will act to propagate any shocks in general equilibrium, including monetary shocks. However, there seems to be some debate about how quantitatively important this is. Output, consumption, and investment [in the VAR impulse responses] respond in a hump-shaped fashion, peaking after about one and a half years and returning to preshock levels after about three years. So, the responses of real activity to monetary policy shocks estimated by CMM exhibit two key features. First, the effects take a long time to peak and to dissipate, in a manner that seems consistent with the Monetary History and other VAR evidence. Second, the response exhibits delay - that's what the "hump shapes" are about. 1. Sticky prices: There is Calvo pricing. Not only that, but if a firm gets to re-set its price, it must do that before knowing the current period's monetary shock. 2. Sticky wages: Households set their wages in a Calvo fashion. 3. Sticky utilization: It is costly to change the utilization rate of capital. 4. Cash-in-advance purchases of labor: This works as in Tim Fuerst's segmented markets model of monetary policy, and gives an added kick to employment from a monetary policy shock. 5. Costs of adjustment associated with investment. What's going on here? For the most part, the five frictions above are not well-grounded in microeconomic theory, nor are they well-supported with microeconomic evidence. We of course know that firms do not make decisions continuously but at discrete points in time. But why should it be costly to adjust the capital stock, or to change capital utilization? It can be infinitely costly for a firm to change its price if the Calvo fairy does not allow it, but in the CMM model it is costless to index price decisions. Why? Because that helps in fitting the data. Ultimately, then, we have a model which does a good job of fitting VAR impulse responses, but seems to have thrown out a lot of economics along the way. So, what do we know about long and variable lags associated with monetary policy? Not much, it seems. We don't have good theories of persistence and delay associated with monetary policy actions, and it's hard to trust the empirical evidence that is used to argue for long and variable lags. Further, the theory we have tells us that policy design is about evaluating the operating characteristics of economies under alternative policy rules. And, in that context, thinking in terms of actions and lagged responses is wrongheaded. Let's go with that. Words such as "grim" and "dismal" were used to describe Friday's employment report, which featured a payroll employment growth estimate for September of 142,000. Indeed, I think it would be typical, among people who watch the employment numbers, to think of performance in the neighborhood of 200,000 added jobs in a month as normal. Thus, labor force participation has dropped among the young, and among prime-aged workers, but has held steady for those 55 and older. So, there are two effects which have reduced aggregate labor force participation since the beginning of the Great Recession: (i) participation rates have dropped among some age groups, and have not increased for any age group; (ii) the population is aging, and the old have a lower-than-average participation rate. Next, we'll go back to the 1980s, as that period featured a major recession, but with a very different backdrop of labor force behavior. The chart shows the population, aged 15-64 (just call this "population"), labor force, and employment (household survey) for the period from the beginning of the 1980 recession to the beginning of the 1990-91 recession, with each time series scaled to 100 at the first observation. This is a period over which the population grew at an average rate of 1.1%, while labor force and employment grew at average rates of 1.6% and 1.7%, respectively. 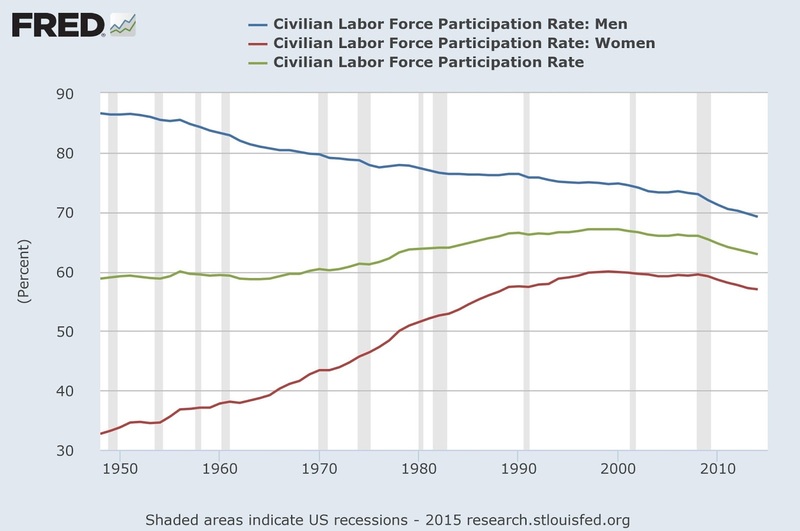 Over this period, employment could grow at a higher rate, on average, than the population, because of an increase in labor force participation, driven primarily by the behavior of prime-age workers. 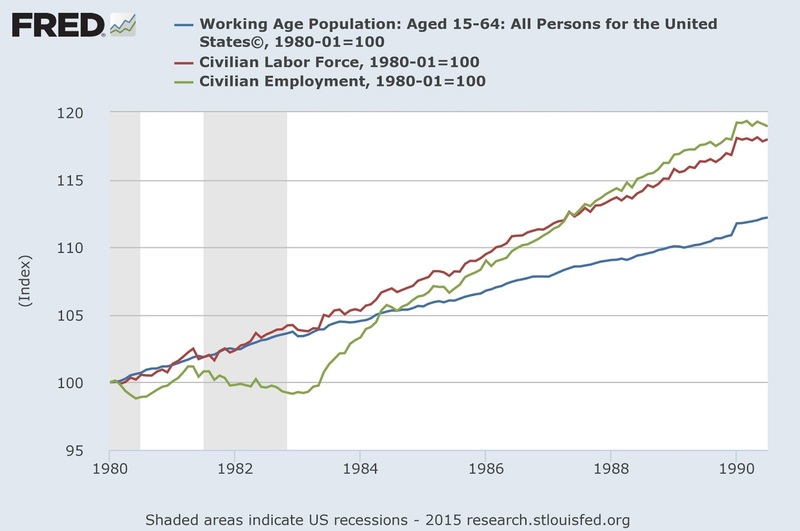 It should be clear that, over the long run, population, labor force, and employment have to grow at the same average rates - again, as a matter of arithmetic. 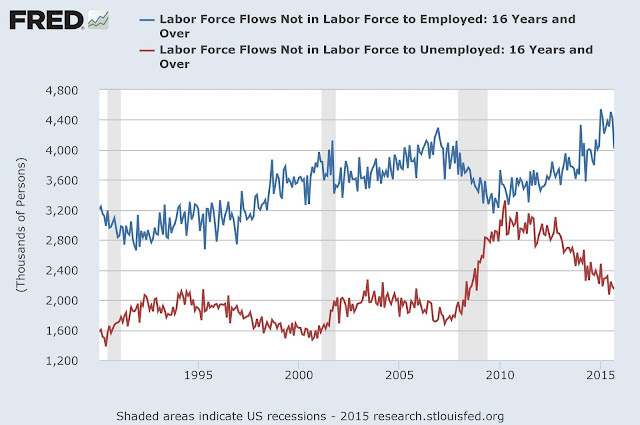 But, over the short run, employment can grow at a higher rate than the labor force if unemployment is falling, and the labor force can grow at a higher rate than the population if the participation rate is rising. Fast forward to the recent data. 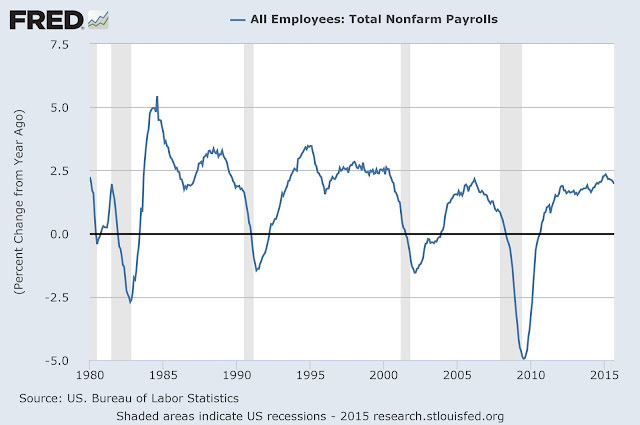 For more than three years, employment growth has been sustained, at close to or greater than 2%, year-over-year. And, with labor force participation falling, that growth in employment, in excess of the 0.5% growth rate in population, has come from falling unemployment. This shows (with the two series scaled differently to highlight the correlation) the time series of long-term unemployed and the monthly flow from unemployment to not-in-the-labor-force. Clearly, the two time series track each other closely. This is related to a phenomenon labor economists call "duration dependence." During a spell of unemployment for a typical unemployed person, the job-finding rate falls. A person unemployed a few weeks is much more likely to find a job than a person unemployed for a year, for example. 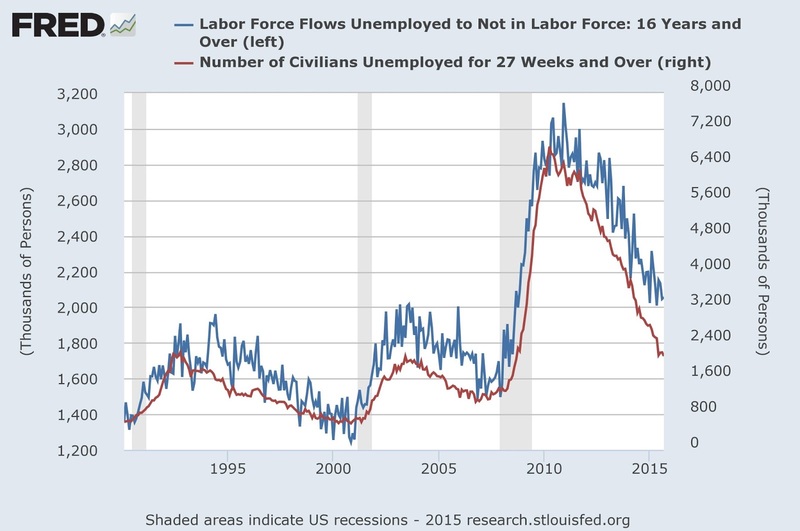 Thus, as we can see in the chart, it is likely that a long-term unemployed person does not find a job, and exits the labor force. These flows were high relative to pre-recession levels, but are close to, and moving back to, those levels. 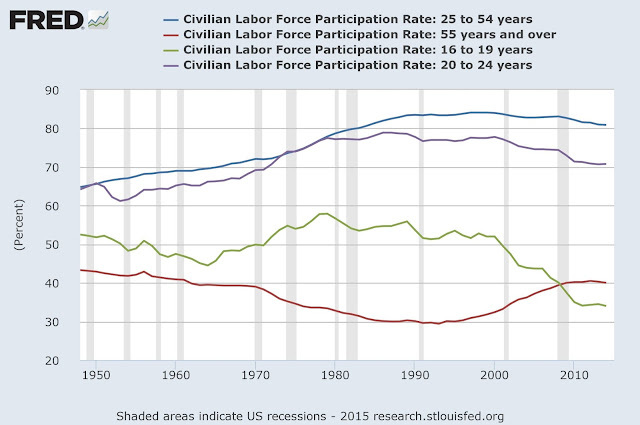 These charts reinforce a view that the fall in labor force participation, post-recession, has been driven by long-run factors, and those factors show no sign of abating. Thus, we should not expect the labor force participation rate to stop falling any time soon, nor should we expect it to change course soon. Conclusion? 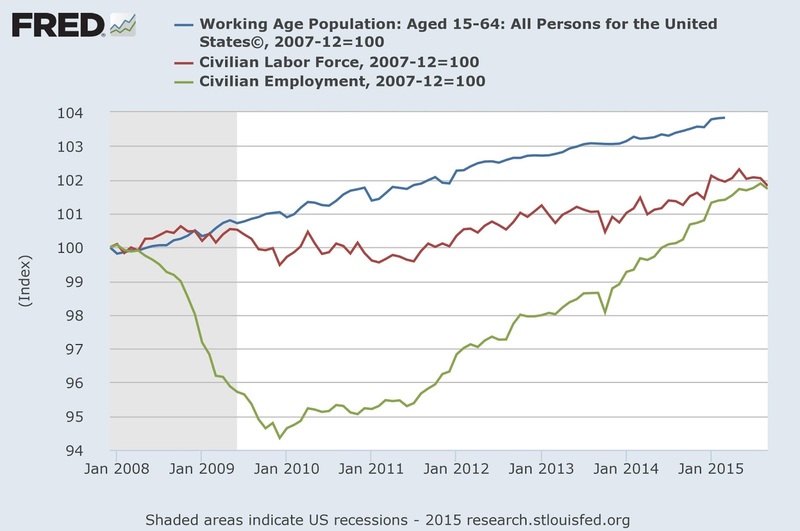 With the population aged 15-64 growing at 0.5% per year, if we're getting payroll employment growth of more than about 60,000 per month (that's 0.5% growth in payroll employment per year), this has to be coming from the pool of unemployed people, or from those not in the labor force. But further significant flows of workers from unemployment to employment are unlikely, and the net flows from the labor force to NILF are likely to continue. Thus, employment growth of 142,000 may seem grim and dismal, but labor market arithmetic tells us that employment growth is likely to go lower in the immediate future.